A fresh relic was unearthed in the distant East and the retreating ice sheets of Siberia - the ancient bones of a forgotten race, once again touched by sunlight and air, stirring the caged memories within. Tendrils of this prehistoric demon's soul wrapped themselves around those who made the discovery - entrancing, captivating and compelling them with its dark story from the deep past. It is a tale that runs eternal, an account of the deepest savagery of nature - a conflict that has spilled across every conscious being and drives the endless cycle of life. EATBRAIN channel a tale of a forgotten age through the unique minds of SEGMENT & CONCEPT VISION and their MAMMOTH EP. Featuring 4 precisely engineered cuts of audio that reach into the fraught and fractured core of existence and tear deep grooves into those who listen. VINTAGE opens the EP with luscious dub-driven pads and undulating tones that drop into a shifty and tight neurofunk banger, punctuated by pitched vocal stabs. RADIANT tears up the dance with a strobing and sweeping bassline, backed with a beautiful yearning melody and soft arpeggios. 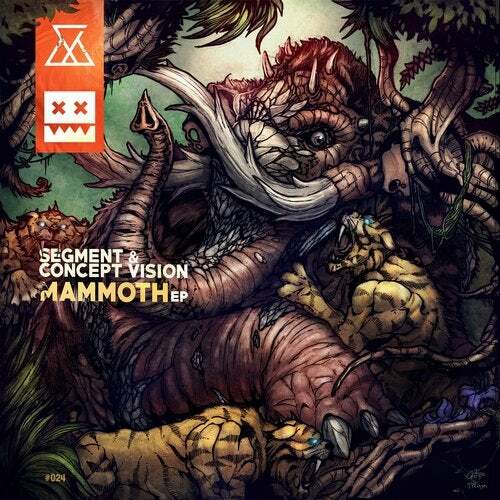 The title track of the EP MAMMOTH takes careful aim before striking a series of brutally syncopated blows, before HEIST takes down the rave in a flood of sirens leading to a stepper with an eminently catchy hook and deep, driving vibe.